Serendipity. It’s a word that Red likes a lot. Me – I usually don’t think that there is any particular order to the universe. However, on nights like tonight, I do enjoy the random synergy that happens to occur from time to time. I travel for work. In fact, I travel quite a lot. As with all Road Warriors, I take my solace where I can. One of my guilty pleasures is pulling up Google Maps and typing, “gastropubs near by” and then sampling the local delicacies. More often than not, I am disappointed with mediocre food and barely passable beer. Tonight, my ritual paid off. I had done my usual routine and there was a ‘brew pub’ close by, but upon closer inspection it was a national chain. I immediately nixed it from my plans. The weather was looking to turn foul and I had no desire to spend my hard earned cash at a conglomerate that would then have me walking home in monsoon type weather. Despondent, I walked back to my hotel and Google informed me that there was a gastropub about a half of a mile from my hotel. The name was The Side Door. Interesting. It sounds like a speakeasy. “What the hell”, I thought. It’s either that or hotel food and I was not about to let a minor typhoon dissuade me from some potential deliciousness. So, off I went and I wasn’t disappointed. The Side Door is a side restaurant to Lawry’s Steakhouse. I was bummed. The last time I went to place like this, I could not get my Manhattan properly made. I have never been so happy to be wrong. The food was delectable. I had come in looking for a sandwich and I wasn’t disappointed. I smartly ordered the housemade pastrami – apparently a staple of this establishment since its inception – and was handsomely rewarded with the best pastrami sandwich of my life. This is nothing to say of the duck comfit poutine that accompanied my meal. It was delectable. I come to find out that Jeff is the restaurant manager. We are introduced and it is readily apparent to me that Jeff is hungry to make his establishment better and I am sucked into the epicurean vortex that is Jeff. I planned to leave at 7:30pm. As I write this blog at 12:42 local time, I am still surprised how much time has elapsed. I talk to Jeff on how from time to time I will brew my own beer and he is intrigued. He wants to make The Side Door a beer aficionado destination and asks me to try some beers with him. Jeff is no slouch. He knows his stuff. We drink Ogden from Goose Island and then a Blackheart from Three Floyds Brewing Company (Bourbon notes in an IPA!) and then a cheese pairing with Opal from Firestone Walker Brewing Company. Then…oh my science, then we have what is quite possibly the best pairing of alcohol and food I have ever had in my life. Jeff brings out his toffee pudding and Very Mad Cow by Revolution Brewing Company. Words fail me. The lactose in this imperial stout blends into sublime joy as the toffee of the pudding melds with the beer. As the night progressed, we both talked about sitting for out Cicerone exam and the terrors and challenges that are involved, as would any sane person. With that said, Jeff already gets it. I have had some crazy pairings in my life from certified sommeliers that worked beautifully, but few times compare to the toffee pudding and the Very Mad Cow delightful pairingCertification or not he is a maestro. This isn’t to say we agreed on everything. I thought his cheese pairings with Firestone Walker’s Opal that were off, however he had a reasonable justification for his decision citing immature palates and given the current clientele with whom I spoke, he knows his audience. Among almost every craft beer drinker, the mere mention of Anheuser-Busch InBev or SABMillerCoors will bring an immediate snort of derision. Take this post by beerpulse.com and that pretty much sums up the feeling of most craft beer drinkers. Admittedly, I too had this type of visceral knee-jerk reaction when I originally read that AB-InBev was acquiring Goose Island, but my opinion is evolving. There are plenty of reasons to dislike a lot about the macrobreweries’ business practices. One can easily go to Netflix and fire up Beer Wars and feel a sense of righteous indignation. I am no fan of the three tier distribution system and the overt influence that AB-InBev has on distribution due to the near monopoly it has on the network within the United States. However, those that follow the craft beer segment seem to either willfully ignore or are blissfully ignorant that some of the larger craft breweries exert similar influence to get their product to market. I can hear the counter arguments now: “What about Jim Koch giving hops to craft breweries when there was a hop shortage?” and “Harpoon helped out The Alchemist during a flood”. Sure, those things happened, but make no mistake, that era is over. I had a candid conversation with the owner of a prominent craft brewery in the DelMarVa region and he all but declared the era of collegial affiliation dead. While we all love that new breweries are popping up all over the country, that means the finite shelf space available in any liquor store is growing increasingly smaller as is the availability of open taps in pubs. Those with the power (and money) will do everything to maintain relevance. We all know the extreme efforts that the big boys will take to ensure prominent shelf space, but the larger craft brewers are increasingly doing the same thing. Go to any airport in the country and the bar will have a couple of the macros and at least one Samuel Adams beer on tap. Boston Beer Company has taken painstaking efforts to ensure that everywhere the big players are, they are right next to them. What amazes me is that Boston Beer Company seems to get a free pass utilizing similar tactics to AB-InBev and the other big players. Hell, the designation of what a craft brewer was changed to six million barrels of beer produced annually just so Boston Beer Company could stay in the club. Locally, this is happening on a lesser, but similar scale. On the East Coast, Dogfish Head will exert influence to do everything from ensuring prime shelf space to an entire tap-takeover at prominent craft beer bars. In essence, they are forcing out the smaller craft brewers the same way that the macro-breweries did to the craft segment a decade ago. Again, these larger craft brewers get a free pass from the community. How do we reconcile that cognitive dissonance? I’m not really sure, but I think a good hard look at the benefits of larger players in the space may a good place to start. The impetus to this blog started the other night at a small local pub that happened upon a keg of Goose Island’s 2013 Bourbon County Stout. Unsurprisingly, I joined a buddy to enjoy a glass. As always, the Bourbon County Stout was outstanding and this started the conversation. Say what you will about adjunct lager and macrobrewery beer, it is if nothing, but consistent. When you open a Budweiser, Heineken, or a Miller you know it is going to be exactly like every one you had before and every one you will have after that. Any brewer worth their salt will tell you just how hard that is to achieve on a small scale let alone the gigantic proportion that the largest breweries create. Even the larger and more established microbreweries have quality control issues. The best example is when Dogfish Head had to dump an entire run of their 120 Minute IPA. What if the best of both worlds collide? What if the flavor, innovation, and quality of the best microbreweries are combined with the consistency, economies of scale, and distribution of the biggest players on the planet? I don’t think this is an unreasonable thought. The biggest breweries are hemorrhaging market share. In contrast, the craft beer market grew 17% by dollars in 2012 to capture 10.2% of the market by the same metric. Don’t think this has gone unnoticed. A quick look at the Blue Moon craft beer commercials with absolutely no mention of the parent company is a perfect indicator of the depth of understanding the large players have. They have to adapt or die. It won’t be a swift death blow, but it will be a death of a thousand cuts. The acquisition of microbreweries like Kona and Goose Island show the long term vision of players like AB-InBev. However, the margin for error is slim. Already, Kona quality is not the same as it has been prior to the acquisition. If that becomes the standard marker for acquired breweries, the patience of the craft beer drinker will be even less for the big breweries (if that is even possible) than it already is. However, if the quality is consistent and excellent products that were once unavailable in certain regions – like the aforementioned Bourbon County Stout on the East Coast – become accessible, I don’t see how this isn’t a universal win. I am by no means sold on the macros foray into the craft beer space, but that glass of Bourbon County Stout gave me hope that the entry of the macros into the craft beer segment will not mean the death of a movement, but instead the potential for enhancement. It is no secret that Oregon is a Mecca for the craft beer enthusiast. According to a 2011 Oregon Brewers Guild report, there are more than 150 microbreweries in the state. It ranks third in the United States in breweries per Capita, and it is home to some of the best known craft breweries in the U.S. like Full Sail, Widmer Brothers, and of course Rogue Ales. However, for of us on the wrong side of the Mississippi, we do not often have access to the lesser known breweries that do not have the distribution power of the bigger players. This is why I was ecstatic to receive a package in the mail this afternoon that contained not one, but two bottles of beer from one of the smaller breweries in Oregon, but I’m getting ahead of myself. I was in Portland recently and while there, I was able to sample a number of the smaller local beers. One of them was an American IPA: Mosaic by the Crux Fermentation Project in Bend, Oregon. A former colleague of mine noticed that I was drinking it when I checked in on Untappd and said that they had much better beers than that. I was quite taken aback because I thought the Mosaic was an excellent and one of the better American IPAs I have had in some time. To make an already long story short, this good fellow sent me a bottle of their Freakcake and Doublecross beers from their Banished Series in an attempt to prove his point. Tonight I cracked the Freakcake. Part of this was inspired by a conversation I had with the erudite gentleman who doesn’t blog nearly enough at Fine Day for a Beer. I had been contemplating cellaring the beer, but he made an excellent point that the lemon and orange zest characteristics would get lost if left to age. I agreed. So, I cracked it open and poured myself a glass. Surprisingly, we were both wrong. Freakcake styles itself an Oud Bruin Ale (BJCP Category 17C) and comes in at a hefty – and well above style – ABV of 10.5%. Usually, I’m okay with this. I like big bold beers and many times the higher ABV enhances the beer in my opinion. The packaging is simple: a 375 ml bottle sealed with wax. 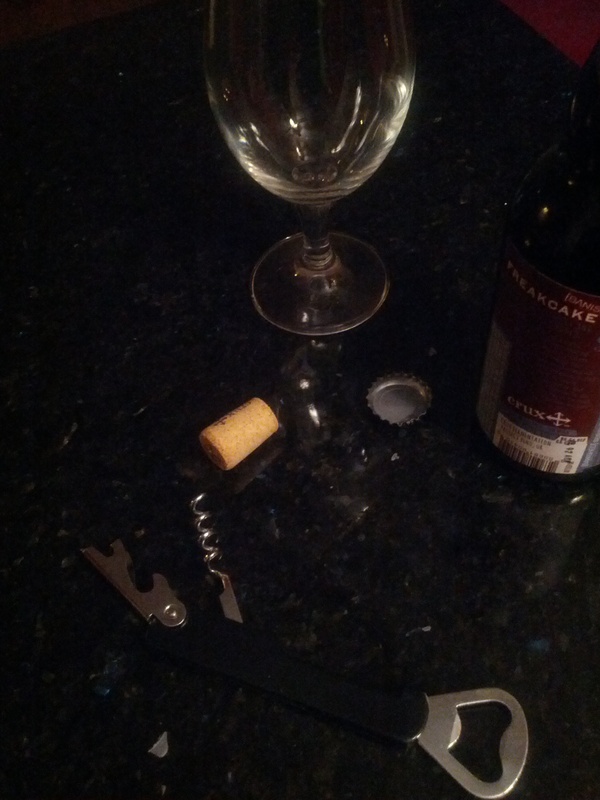 As I pop the top, I notice that the bottle is corked. I am not expecting this and I realize that I have probably made a huge mistake in not aging the beer. Nevertheless, I remember that regret is for suckers and I get to work. The beer is gorgeous. It pours a beautiful ruby with a creamy white head. However, the head dissipates quickly with little lacing. Nevertheless, I am transfixed by the color of this beer as I hold it up to the light. The clarity is superb and it is positively glowing. I eagerly take in the first note of the beer. It has an excellent sour nose that is heavily laced with cherries and plum, but the brightness that I expect from the zest is non-existent. The taste is not at all what I expected from the nose. Again, the zest is nowhere to be found. This is a decidedly brown ale, which is absolutely correct for the style and something that I love, but much different than is suggested on its label. There is a distinct chocolate taste up front and noticeable notes of caramelization. The mouthfeel is silken as it glides over the tongue. Raisin and plum poke through, but the deep complexity with the overtly sour notes from an Oud Bruin, especially one that is this big, are missing. Reading what I have written; this may seem like harsh criticism. It isn’t. I like this beer, I really do. However, there is something distinctly missing from this ale: time. Oud Bruins age fairly well and the fact that this beer is corked suggests that the brewers intended it to be cellared for some time. Oud Bruins flavor will continue to sour as time progresses and I think that time is the only thing needed to make this good beer great. I hope I can have my friend grab me a couple of more bottles so that I can report back in a year and then three to see what complexities have arisen in this soon to be great beer. I love IPAs. I especially love big bold Imperial/Double IPAs, but there is no damn need to have an IPA Day. IPAs are ubiquitous. You can’t swing an empty growler without hitting a new brewery’s IPA and for the most part, I am quite happy about that. It’s great that the growth of the craft beer movement is showing no signs of abating. I am also very happy that American’s palates are slowly but surely migrating from flavorless adjunct lagers to the far superior craft beer segment. All of the positive aspects aside, IPA Day is a really mindless exercise. Someone will gnash their teeth, rend their garments, and cry at the sky that IPA Day is a way to get people to try new beer. Really? No, no it’s not. I know I like IPAs. I have friends that proclaim that IPAs are their favorite style of beer. Why do you think that we need to be convinced to drink an IPA? Do you really think that your Coors/Miller/PBR drinker is suddenly going to dive into and enjoy Pliny the Younger or a Green Flash IPA? At best, that person is going to be polite and say it isn’t to their liking and at worst, you have turned them off of craft beer. Instead, I not so humbly suggest that we flip IPA Day on its head and have Different Beer Day instead. Hop heads could challenge their palates on the subtle nuances of a geuze. Belgian aficionados can explore the deep sweet depths of an imperial stout. One could step completely off of the reservation and try some mead. More importantly, we can introduce macrobrewery drinkers to gateway craft beers like Fat Tire (like I did with my step-father who is over 80 years old – it’s never too late to improve one’s palate) or Mama’s Little Yella Pils. Stop reinforcing the norm. Buck the trend. Shift the bloody paradigm. Call it whatever you want, but for the love of all that is good with craft beer drink something different today.